You may notice the lesson number is out of sequence. That’s because 10/9 was the day Pat got her first all clear scan after surgery and chemo. 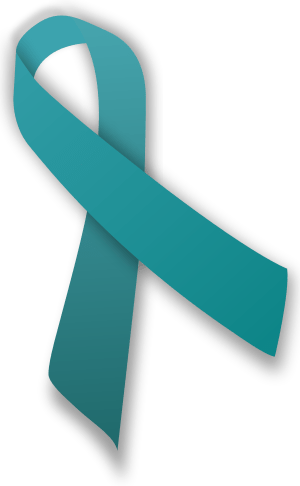 English: A teal ribbon, which is an awareness ribbon for Ovarian cancer (Photo Credit: Wikipedia). No matter what comes before it, breast, colon, prostate, liver, ovarian, CANCER is a scary word and the second question you ask yourself is “How did these rogue cells get into MY body?” Sometimes you can figure out why; most of the time there is no answer to that question. Suddenly you look around for your color of ribbon and you hope to see it everywhere so you know people are trying NOT to let it happen to the next unsuspecting person. You buy a few new pieces for your wardrobe, or a new shade of nail polish to remind yourself (as if you could forget) of a new obligation on your part–to advocate, pay it forward, and protect the next person from having to go through what you’re facing. The lavender ribbon is the support color for ALL cancer awareness, and maybe we should paint the world lavender. Or maybe we should each educate ourself in our specific colors and do what we can to advocate for more research, more funding, better treatments. Often, a drug or treatment that is useful for one type of cancer can be used to treat another kind, or modified to target a different cancer cell. Progress IS being made every day, and whatever color ribbon we wear, any advancement is an accomplishment. Kym’s note: As a good example of what Pat’s talking about, I was unable to find royalty-free clip-art of a lavender ribbon. I chose teal because last month was Ovarian Cancer Awareness Month, and I saw very little of the color anywhere. I also chose to display it in Pat’s memory. She died early last year. I believed it then and still do. One way or another. Cancer Lesson #5: Everyone reacts differently. The doctor’s office called early on Friday, March 18 2011. She wanted to see me as soon as possible, early that morning if I could manage it. Better to face bad news sooner rather than later, I thought, and agreed I’d come as soon as I got dressed. From the timing of the call and the urgency in the secretary’s voice, I knew my diagnosis was cancer. The only surprise was one of my lumps — sorry, masses — was nothing. The one I’d found was cancerous, and the third was an engaged lymph node (not good news). I didn’t cry — not then and not much later — focusing instead on what would happen next. It’s so weird to find out you have cancer, to learn that your body is harboring something that, if left unchecked, will kill you, especially when, like me, you have no symptoms. You feel as if you’ve slipped into an alternate reality, kind of like the suspension of disbelief you experience when watching a movie or reading a book. I’ve thought about this a lot, and the analogy I keep coming back to is that of a train. You’re on this train, following the same track day after day, when click, you’re switched to a completely different route. All the other trains continue on the main line while you take a detour over some rough but scenic rails. Perhaps you’ll rejoin the fast track again, perhaps not. Nobody knows, but for now at least, this new track is your only way forward. Everyone reacts differently, not only emotionally but physically too — this is a lesson I’ve learned again and again. The range of possible emotions is so wide — everything from anger to fear to outright disbelief. There is no one right way to feel. I remember driving home thinking, “I should be crying. Why am I not crying?” but all I could think of was how I would have to ask someone else to captain my soccer team and where and when I could tell my family. I decided to tell my husband that night, but not my daughter. She’d just gotten her driver’s license the night before. That’s such a milestone. I couldn’t ruin it for her so quickly. It was thoughts of her that brought the only tears to my eyes that day, when Dr. S suggested I be tested for BRCA1 and BRCA2. She recommended this course of action because I was “young” and one of my aunts also got breast cancer early, and then got it again thirty years later. The idea that I might have passed on such a gene to my only child scared me more than anything else I might have to face.